Drag and Drop - Anywhere! Totally customizable schedule to match what you’re studying in class. From day-to-day to micromanaging your schedule to align with your classes. Organize: Drag and drop topics to closely match your school’s curriculum. Manage: Drag and drop leftover tasks when you get behind or get ahead by moving items from the future into your schedule. You’ll now find the birds eye views in a new navigation bar on the top of the Study Schedule. It’s easy to get lost in the weeds, so this is a quick way to see where you’re at with your studying progress, and to see key milestones such as Full day “Practice Exams”. You’ll find multiple study schedules in any view. You can toggle which schedule you’re looking at by clicking on the filter on the left hand side. Schedules are based on topic and resources. You can have two schedules within the same time frame but focused on different topics. For example, you can review basic sciences while studying organ system pathology. Within the settings panel located in the upper right hand corner you can easily navigate between your different schedules and settings within a schedule. Complete your days task, and finish with a thumbs up and encouragement from Osmosis. 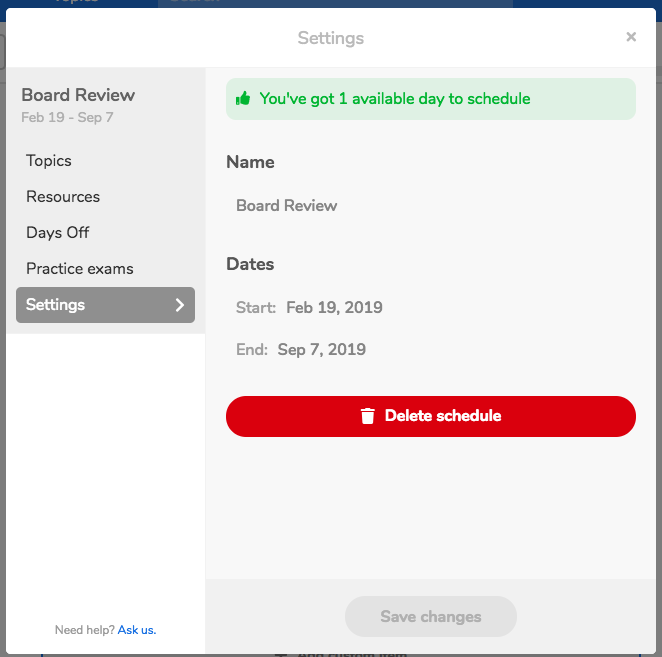 After finishing study activities for the day, you can quickly find items that are completed, saved for later, or not completed by filtering your view. If you want to study all of the videos first, regardless of the topic, in a day, you can go to “Sort by” then select “Resource” in the week or day view. You can use different resources in each of your schedules. Just click “Resources” and select the resources you’d like to use for each schedule. You can add custom resources, such as Uworld or Kaplan, to get daily tasks to complete. You can also incorporate days off into your Study Schedule to help you retain what you’re learning. Use these days to catch up, get ahead, or just take the day off! We’ll automatically recalculate your schedule so you don’t fall behind. As with days off, we’ll recalculate your Schedule so you won’t miss any educational content. In the Day and Week view, clicking the “Videos” action item will expand a window of videos. You can watch your scheduled videos right from this view. You can select which Case Questions or Flashcards you want to quiz on by clicking the Flashcard or Question action item, then “Start”. When you’ve finished your quiz, you’ll be returned to the schedule. Alternatively, you can “Save to Queue”. Once these are saved in your Queue, you can easily access a mix of Case Questions easily from your mobile app to use in offline mode. Deleting a schedule is permanent - make sure you're ready to delete because we cannot recover deleted schedules once they're gone! Where is the new Study Schedule? To create your new Study Schedule, go to Edit dashboard in the hamburger. The Schedule icon and button will appear in your dashboard.